Adi & Erez boast a combined 25 years of entrepreunership, sales and education experience. They understand the importance of hard work, honesty and professionalism and navigate each transaction with these core values at the forefront. They are determined to provide their clients with the utmost devotion, exceeding expectations each time. Adi & Erez customize each sale and purchase of property according to their client, their individual goals and the marketplace. They are up to date on the constant changes in the real estate market and ensure their cients make informed real estate decisions armed with their wealth of expertise and information. With their skilled negotiating abilities, total commitment to customer service and refined work ethic, they are an important asset to all of your future real estate ventures. Selling or buying your home can be an emotional process at the best of times. Couple that with divorce, there is no question that you need a particular type of person by your side. Someone who will first and foremost listen to your unique needs, do everything in their power to advocate for you and ultimately guide you through the successful sale, purchase or lease of your property. 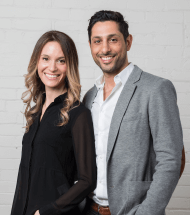 Adi & Erez are a real estate team who work together to ensure your experience is as positive as possible, with as little stress as possible. Their committment is above all to their clients, and their track record and client testimonials attest to that fact.